I made a pour over coffee maker out of a plastic cutting sheet and zip ties. It weighs next to nothing and can be folded down, which makes it great for the backpacker (as well as anyone else) who can’t live without freshly brewed coffee in the morning. I purchased both the cutting sheets and the zip ties at a the dollar store, so cost for this project is just 2 bucks! The tools required for this project are very basic , just a ruler, a straight edge, a utility knife or scissors and an awl. To start cut two pieces from the 14 X 11 cutting sheet that are 6 X 11 as pictured. Fold the two pieces as pictured below. First fold the straight line down middle, and then fold the angles which are done in the opposite direction of the first fold. 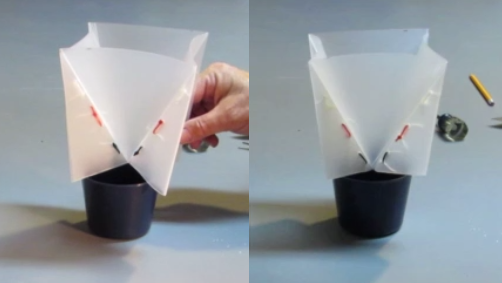 When both pieces are folded, place them back to back and note the cone that is created. Use the awl to punch the holes for the zip ties that hold the pieces together. For each zip tie, punch two holes about ½ inch apart. Make one hole from one side and one from the other, to make it easier to feed the zip ties through. Put two or three zip ties on each mating surface, close to seam. The Two halves held together with zip ties, before the zip ties are trimmed. Lastly trim the bottom to change the profile so that it forms a slight cone,which will help the device to sit firmly in the cup and makes sure the your coffee drips into your cup and not over the side of your cup. The D.I.Y. pour over coffee maker in use.